Patsy Nation yelled “surprise” when she walked into the PAC Restaurant on Sept. 26, 2012. However, the surprise was already out of the bag. Nation was planning to take the afternoon off, leaving her co-workers no choice but to tell her about the party. 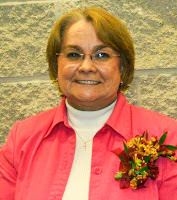 Nation, an office support associate in the Provost’s Office, was named the September 2012 UIS Employee of the Month. Like most employees at UIS, she is known for going above and beyond what is required to help others and get the job done. This past spring, Nation stepped outside her comfort zone to provide staff support for the UIS Campus Senate meetings, while a vacant position was being filled. “Patsy did not just maintain the status quo but implemented improvements to existing processes. She very capably sought out the information and resources needed to perform the job effectively, and followed through to resolve technical issues that surfaced,” said a nominator. Nation is known for her excellent interpersonal skills as she effectively interacts with diverse groups of students, faculty, staff, and guests in the Provost’s Office and while answering calls coming into the main UIS switchboard. “Patsy routinely goes the extra mile to seek out information for callers, even anticipating and gathering information regarding upcoming campus events,” said the nominator. Nation has worked in the Provost’s Office at UIS for the past 8 years. She was also honored with the Employee of the Month award in 2007. As Employee of the Month, Nation will receive a special parking spot for the month along with some extra spending cash on her i-card.